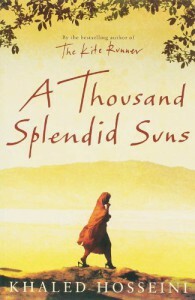 Only 3 stars from me... for those who are wondering if it is as good as The Kite Runner: it's not. at least not for me. Whereas The Kite Runner captured me completely, Mariam and Laila couldn't interest me that much at all. All the male characters (Tariq, Rasheed, Jalil, ...) were pretty one-dimensional to me and very predictive. Even though I frequently visit places mentioned in the book as Murree, Rawalpindi, Islamabad and Nathia Gali, I never felt any connection with the characters. Not like in The Kite Runner at least.